This walk from Dalwhinnie to Glen Nevis was part of the Royal Scottish Geographical Society’s Stories in the Land project. We followed the route of the ‘Thieves Road’, used for centuries by cattle thieves, which traverses a geologically diverse landscape, where changes in the bedrock are reflected in the topography, soil, vegetation and land use. 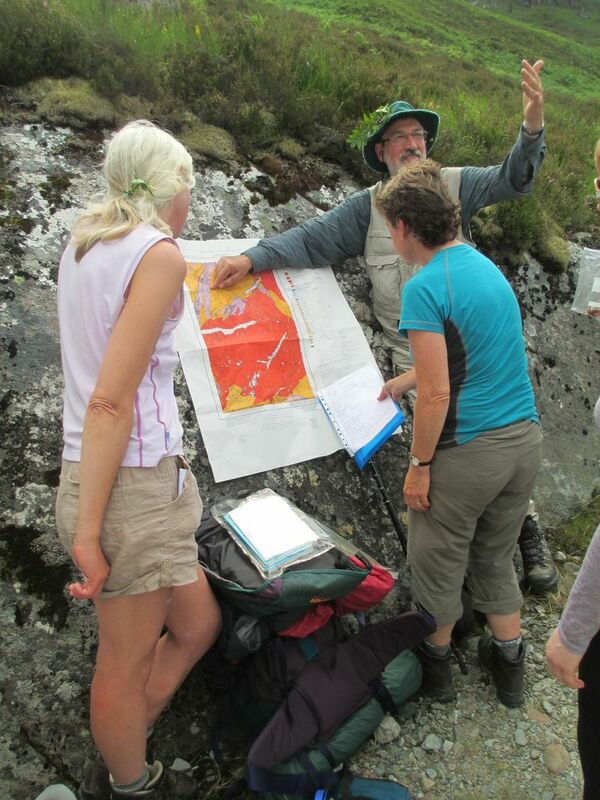 This journey on foot over five days in July 2013 brought together a multi-disciplinary group of 10 participants: a geologist, a geographer, a writer, a poet, several artists, a few educators, and a group facilitator from SpeyGrian Education Trust. This collaborative venture was an opportunity to travel slowly together, engaging with the landscape at all scales, from crystals to mountains, with time to develop our personal reactions to the places we passed through and to share our different perspectives. We were very lucky to have Simon Cuthbert as our ‘resident’ geologist on this journey. He brought the rocks and the landscape to life with genuine enthusiasm, and told geological stories in four dimensions to boggle our minds with the concepts of deep time and continental drift. It was challenging to think out with the human timescale and to think of Scotland’s landscape as dynamic and not fixed. This will I’m sure inspire new ways of thinking for all of us. http://storiesintheland.blogspot.co.uk. Contributed by Jean Langhorne.